A full mouth restoration offers patients who have experienced a variety of dental traumas. From those who grind their teeth (bruxism) to those who have had oral cancer to drug users looking for a fresh start, a full mouth restoration will improve both the aesthetics of your mouth and the function. This helps improve the quality of life and your overall confidence. No two full mouth restorations are alike. This procedure is completely customized to meet your needs and can rely on a wide variety of sub-procedures. Because the point of a full mouth restoration is to improve the health of your teeth, gums, and bite the procedures required to accomplish the end results can vary. Dental implants, dental crowns, dental bridges, veneers, fillings, and more can all be a part of the process. Who is eligible for a full mouth restoration? Because a full mouth restoration is quite invasive, it’s important that whomever is considering the procedure be in good health. Being healthy will make healing and recovering easier, and will also help you get the best results possible. How long does a full mouth restoration take? The length of your full mouth restoration will depend on how many procedures are required to accomplish our goals. Generally, however, you can expect multiple visits over several months. This is because each procedure will require recovery time and healing. The benefit is that each procedure will help improve your quality of life and confidence. So each procedure is a step toward a better future. What is recovery from a full mouth restoration like? Because the restoration occurs over several months, recovery usually occurs in steps. This allows your body to heal best, so it doesn’t go into shock and reject things like implants. 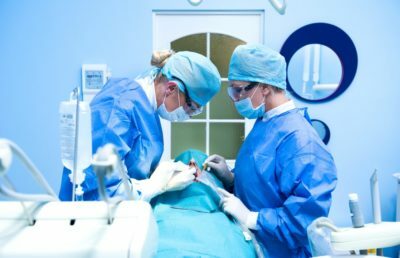 Procedures like fillings require far less healing than something like a dental implant, which requires your bone to heal.